Since 1967 handling, branding and medication of cattle has been a challenge. A friend in Oklahoma once said the most stressing time on their marriage was fall calf branding time. The head gate, timing, and all the procedures had to be done just right -- exactly the right timing. This is in 1967 when my Dad held the rear, a good neighbor sat on the front, while I applied the brand. This worked okay, we never broke a leg or horn. Yet in the old days of the open range this type of cattle handling took 3 months to work the herds. Today people want the branding to be done in a few hours, then return to their regular programing. Most wives don't like to flank calves, nor do the kids appreciate a reckless hoof in the mouth. When artificial insemination became obvious as the fastest method of breed improvement, the head and healing on the ground wasn't the most romantic method. We had to confine cows in a steady, standing position, keep the horns safe and protect the technician. This was the next step. It was a side squeeze wooden gate with an enlarged area in the front for big horned cows. Several cattle that became of value were conceived as a result of this old wooden gate squeeze. Doherty 698, Measles and many famous cows conceived here. When this gate was retired it had horn holes, marks and gashes on every side of the boards, but it worked okay. The open areas were too narrow and we often got horns stuck in wrong directions. The good thing about a side squeeze was that an open gate solved every problem. About 1978 we acquired a regular Powder River squeeze chute. This was the standard of the industry and believed to be one of the best ever designed. 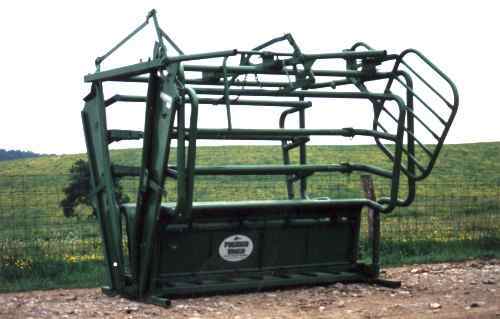 It had the vertical horizontal drop-down bars on the sides, which were a mess when moving big horned cows through it. 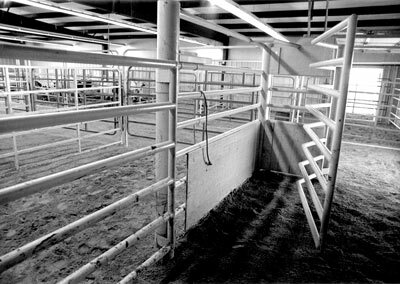 I recall branding Rose Red, Maressa, Conquistador and all the Partlow cattle in this chute. It was nerve wracking. The head catch was the hard part. Being short of funds, we wired a sheet of plywood to the grill guard on an old ranch truck. 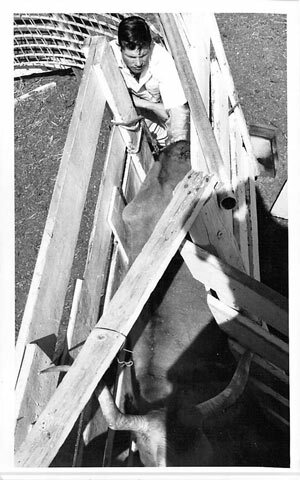 Before the cow entered the chute the truck was driven to about 15 inches from the head catch. It kept the cow from jumping through while closing the head catch. Then the truck was backed up out of the way. It eliminated this one problem, made it safer on big horns, but was not everything we wanted. 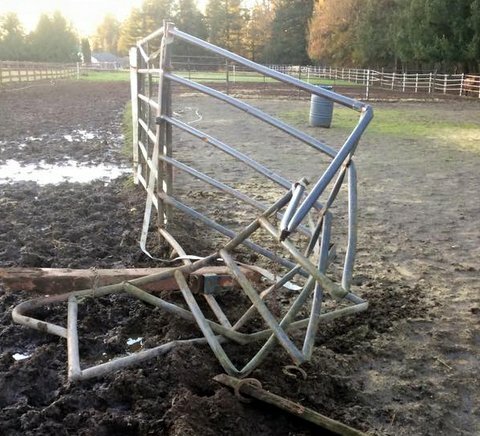 To eliminate cows bouncing through uncaptured we developed a guillotine device which raised and lowered about 15 inches in front of the head gate. It was a 1"X 4' X 4' sheet of plywood in a vertical track, hanging down on a pulley. It was lowered to block the fast runners and raised to measure horns and deal with other facial issues. It was an improvement, but still horns were caught in the vertical bars. Over the years this chute caused two cow deaths, and some horns were broken, either whole horns, or a lot of end tips. Next, step up was a Powder River Classic Longhorn chute. It was much improved with horizontal side bars instead of the verticals. It was obvious now to everyone that vertical bars for horned cattle could never work right. When cattle go through a chute horizontally, horns and legs inadvertently poke out the sides and right there can be certain breakage. It is a trap and does not work safely for horned cattle, nor does it work well on any cattle. Horizontal sides is the safest, and provides the easiest fluid flow. 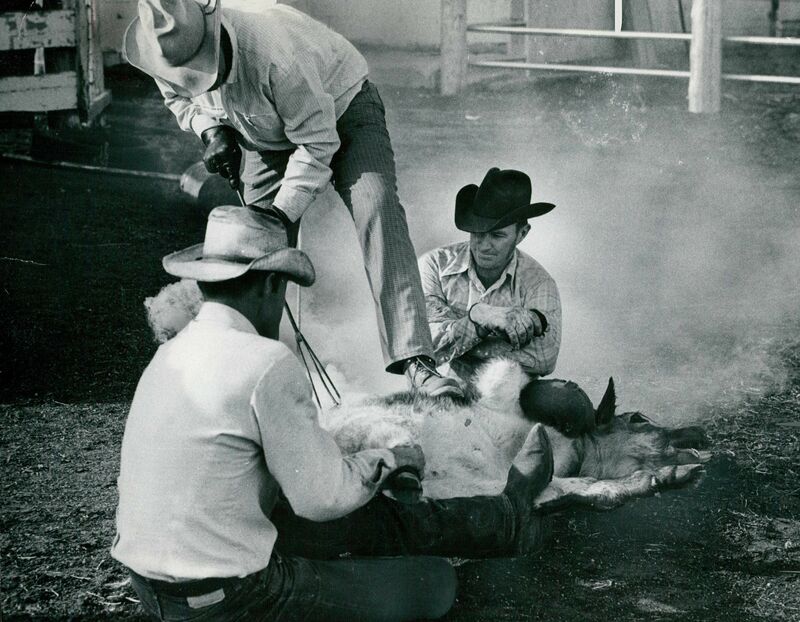 As horned cattle got wider, the Powder River Classic was out grown by the breed. Many improvised the Classic, widened it, yet the head gate closure was still an issue for big horns. In 1979 as non-surgical embryo transplant technology developed we had to have a safe containment for flushing procedures. At one time we drew up a design to confine large horned cows inside a steel cattle trailer with squeeze containment. We were dealing with an embryologist with junk facilities - totally unsafe for valuable cows. On a small, start up scale, we had planned to flush one or two cows and haul them to the embryologist. This ended on paper and never happened. Later in 1979 it was obvious the embryo transfer process was absolutely essential for rapid breed improvement. A professional lab with perfectly safe squeeze confinement was necessary. Using the flaws and successes of previous years, Bob Jardine, a perfectionist welder was given a set of plans to weld a totally safe side squeeze for valuable horned cows. It was designed wide in front for big horns, smooth horizontal pipes and cattle flowed into it from a series of alleys and confinement gates. It worked perfect for over 2000 embryo transfer pregnancies from 1979 to 1984. Never was a cow injured, no horns tipped or broken. Cows stood on dirt which, we learned helped them be more casual. 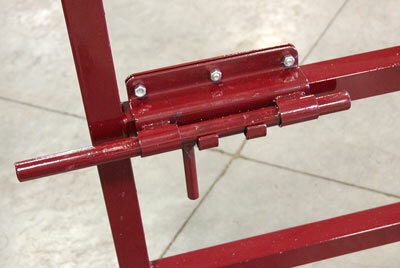 This is the first state of the art side squeeze for valuable horned cattle. When the system became so safe, and great results were achieved, the top cows were sent from all over to the Colorado facility for flushing. 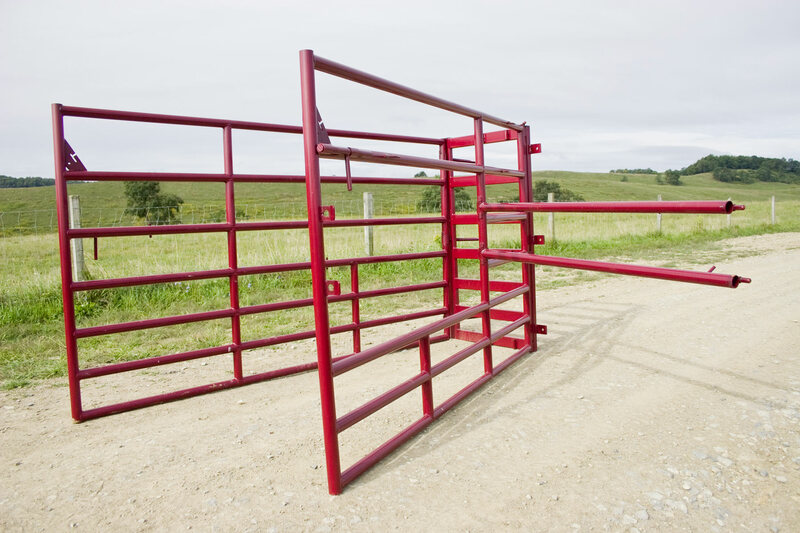 This was the first side squeeze designed for horned cattle, without a head gate. The largest embryo facility in the nation was Rio Vista International at San Antonio. When they lost nearly all their donors to the Colorado program, Rio Vista sent Tom Risinger to Colorado to sniff the tires at Dickinson Cattle Co. (DCCI) He measured the side squeeze, snapped a few photos and was off for San Antonio. Within a month they announced they were prepared to safely flush horned cattle. Several others have designed variations of our first side squeeze, some making life time businesses of producing chutes copying our original design. After the Colorado embryo flush squeeze others were made by DCCI with slight variations. The widened front end was eliminated and pipe spaces were widened at the top to allow horn space. As the Texas Longhorn business flourished several chutes were marketed, bigger and bigger, often more costly. They were designed so heavy, and large, the cost of shipping to buyers has become prohibitive. The Powder River Classic is no longer manufactured. With numbers of experimental designs at DCCI, in 2008 a new concept was drafted. One of the problems was the cost of freight. Freight is the highest in history. DCCI Equipment designed a two side squeeze, no head gate, all purpose squeeze that condenses into a 9' X 5' X 7" size for shipping. It is the BRY Chute. It is shipped common carrier right to a business location of the buyer's choice. The price is $1600 delivered in the USA. This is one of the early BRY prototypes which was later changed in several areas. A major dairy equipment manufacturer agreed to build the BRY with a modern assembly line and exact jig duplication. Several prototypes were developed with simple strap, rope and cleat designs. The BRY serves a market for horned cattle yet works well for all breeds. It is economical and can be used for castration, branding and all types of medications. 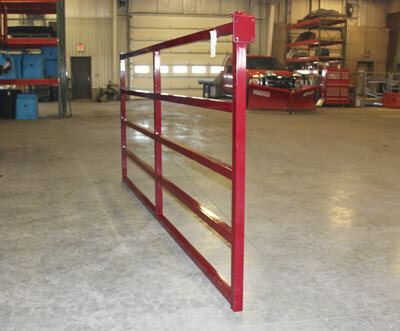 It is all horizontal verticals with no horn entrapments and is installed with 6 bolts to a barn, fence or alley system. The BRY chute displayed, not attached in the use position. The BRY does not set on the ground so it never rusts on the bottom like other chutes. It can be moved easily in a pickup or small trailer. It has two pins which connect the three parts. 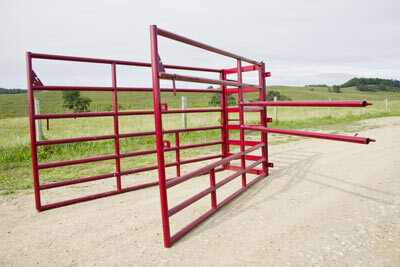 There are 3 settings designed to accommodate small stock, normal cows or large bulls. The BRY is not designed for large operations, but for herds of 50 cattle or less. It is not fast, but is very safe for people and stock. 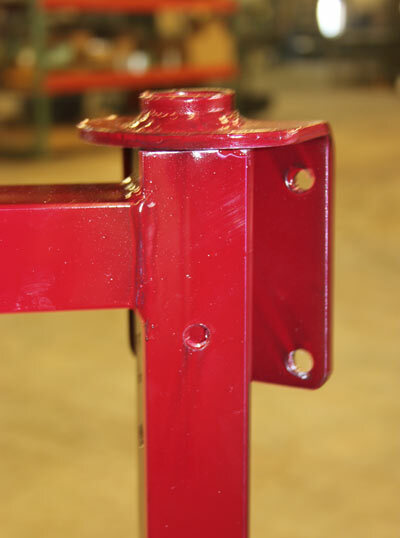 The wider top spacings allow safer reach-in to do pour-on or vaccinations. The BRY chute has become the leading selling squeeze for horned cattle including Texas Longhorn, Yak, Highland, and Watusi. 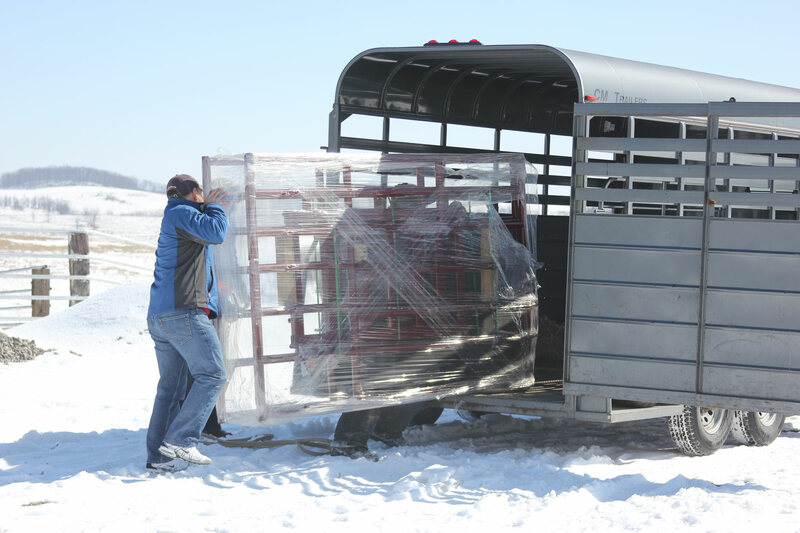 It can be handled with or without a mechanical lift and fits in a small trailer or any pickup. 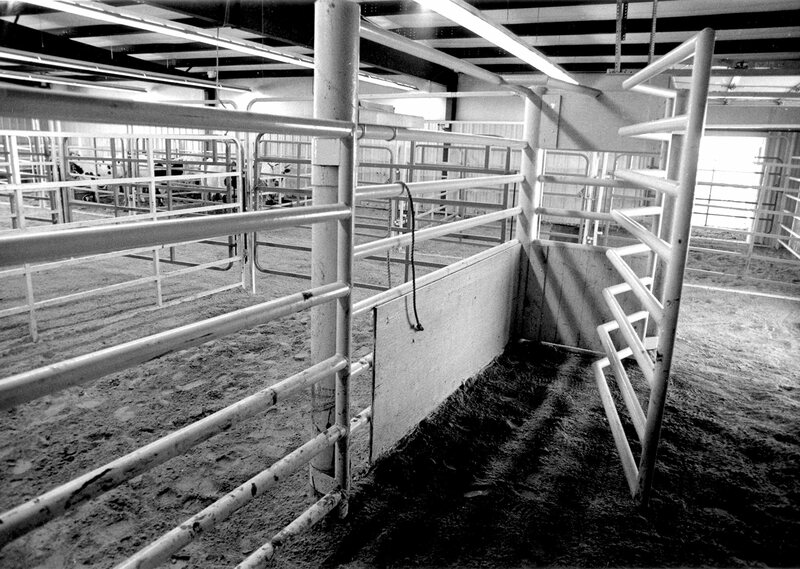 In 1981 the need for quick corrals caused the ranch to buy a number of light weight panels. Cattle learned to crawl under them, they were bent and over the years unusable. After many panels were trashed, a design was developed using square tubing. A jig, table height, was developed to make exact duplicates. Ranch employees made several hundred panels which are still in service at DCCI over 30 years later. Photo Crumpled panels attached. The light weight Chinese import panels are for goats and ponys. 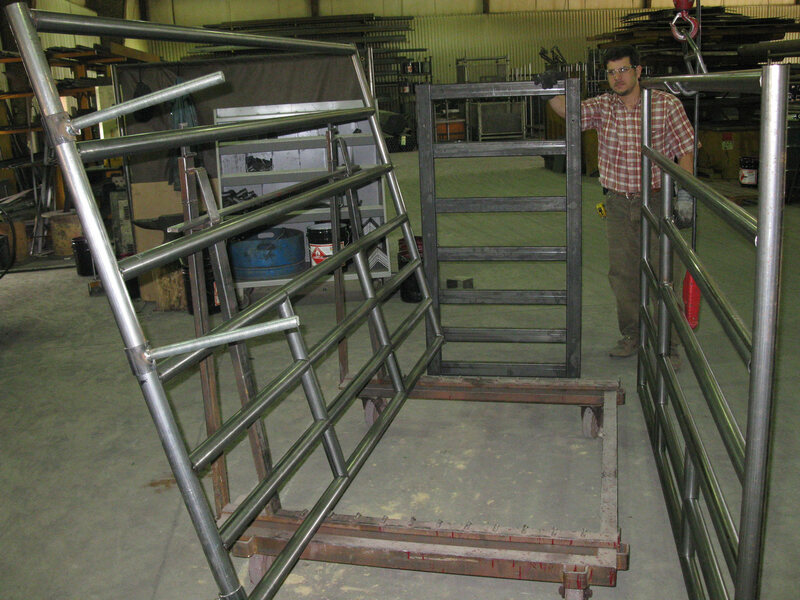 BRY Crowding Panels for heavy use livestock handling. Attachable 3000 test reversible 1" bolt Bry Crowding Panel Latch.